Plot: 2 overly imaginative pranksters named George and Harold hypnotize their principal into thinking he's a ridiculously enthusiastic, incredibly dimwitted superhero named Captain Underpants. Starring: Kevin Hart, Ed Helms, Nick Kroll, Thomas Middleditch. 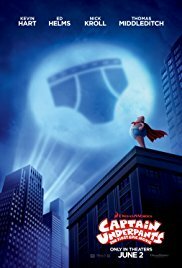 distributed by Fox «Captain Underpants» in the US movie theaters released on June 2, 2017 and has grossed over $126 million worldwide; dvd and blu-ray release date was set for September 12, 2017. Rent from Netflix and Redbox from September 19, 2017. «Captain Underpants» in the UK released in movie theaters on July 24, 2017. The movie released on dvd and blu-ray on December 4, 2017.